The iPad is a very popular tablet computer all over the world. Many people buy it due to its excellent construction and beautiful design. People take their tablets with them everywhere, even in the car. For this purpose, INNORI has come out with a high quality ipad mini car mount that can be used to hold your iPad as you travel. Officially known as the INNORI table holder, it is an innovative ipad mini car mount that can be stuck to the car's windshield using suction. In addition to the iPad, you can also mount other tablet devices. Thus, it is a versatile car tablet mount. 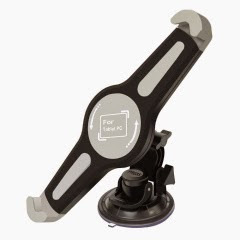 This mount has various characteristics that make it the best car tablet mount on the market. 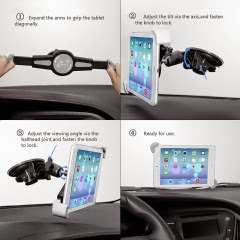 This car tablet holder has a 360° rotation because of the swivel ball head joint and independent axis for tilt control, so you can easily adjust the angle. The spring-loaded arm diagonally grip all 9'' to 11'' tablet computers, including iPads and other popular models like Google Nexus 10, Samsung Galaxy Tab 10.1, Samsung Galaxy Note 3 10.1, Microsoft Surface Pro 2, etc. Diagonal fixation design provides better support and steadiness, preventing your tablets from sliding out, but occupies little room, maximizing the utilization of the limited space in car and frees your hands. 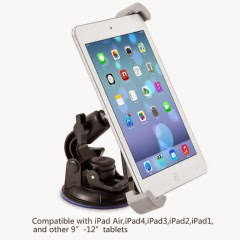 It has a strong suction cup that sticks securely to the windshield and provides steady support for your tablet in the car. Also, the suction cup is applicable for all glass surfaces, so you can use it not only in the car, but also at home or in other proper places. The soft rubber padding on the arm and clamps will leave no scratches on your tablet. The assembling and installation of this mount are easy and quick. To use it, all you need to do is extend the arms of the mountuntil they can firmly grip the tablet diagonally. After that,place your tablet in the arms and push the grips to lock it in.you can then adjust the angle that the tablet tilts at. Theaxis will help you do this and a knob will lock the holder atthat angle. The swivel ball joint allows you swivel the tabletas you desire. It also has a knob you can sue to lock thetablet in the most comfortable position for you. INNORI Tablet Holder for Car Black Windshield Car Mount Holders for 9-Inch to 11-Inch Tablet PCs costs 20.99 and can be purchased at Amazon. It is available in several different countries see their website for details. To more about this innovative product visit their website and the product url below. And now for the giveaway--click here!! That's a really neat looking ipad holder. I've got an ipad on my wish list and as soon as I buy one, I'll check this out to go with it. How cool! I don't have an ipad but a kindle, this would be awesome if it held that. Sometimes I get a recipe off that and need it nearby! We have an iPad and another tablet. This holder looks like a really great product. I'm sure it would be a great accessory for road trips. How cool! We have an iPad mini, I will tell the husband to check this out. What a handy device. I like the swivel ball a lot. I think this would be great for the kitchen, holding the iPad while I do a recipe. My daughter needs this for her tablet! For this particular gadget, I would have to say it would be kept for myself!If I was selected, it would play an important roll in helping me with my disability.